Fun fact for you: New Zealand has 13 national parks covering more than 30,000 square kilometers (11,500+ square miles) of some of the best and most diverse scenery in the world. There are active volcanos in Tongariro National Park, glaciers descending through temperate rainforests in Westland Tai Poutini National Park, dramatic waterfalls and mountains in Fiordland National Park, and the country's tallest peak in Aoraki Mount Cook National Park. 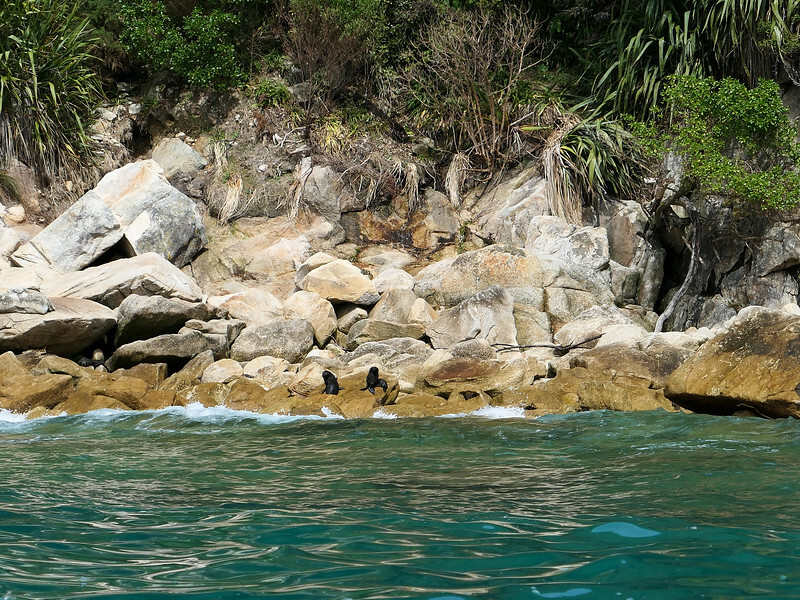 And then there's New Zealand's smallest national park: Abel Tasman National Park. Situated on the northern coast of the South Island between Golden Bay and Tasman Bay, Abel Tasman National Park covers just 87 square miles – but it's a stunning 87 square miles! The park, named after European explorer Abel Tasman, is known for its golden beaches, granite cliffs, and world-class hiking along a coastal track. And it's also known for its kayaking. Elliot had never been in a kayak before. 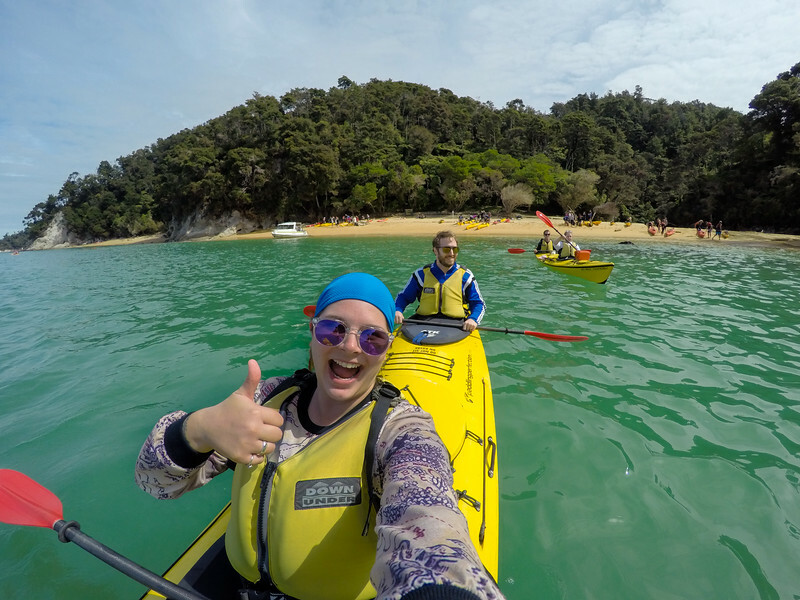 But, always up for an adventure, he was more than game when I suggested we extend our time in Nelson in order to take advantage of a sunny forecast and do a half-day kayaking tour in Abel Tasman National Park. By this point in our New Zealand campervan trip, we'd had a kayaking trip canceled due to cyclone winds, a day-hike canceled due to fog and wind, and a glacier hiking tour postponed due to rain – so we were pretty excited to have another chance at doing something outdoorsy in good weather. 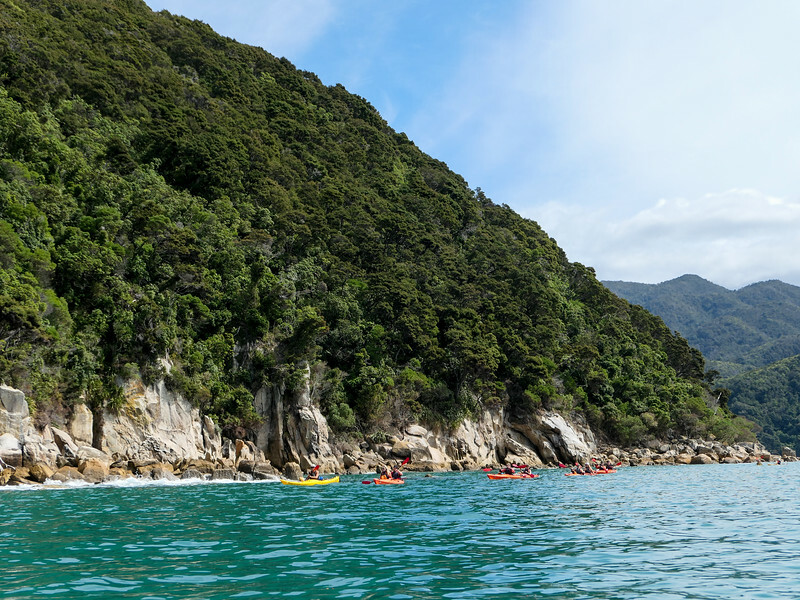 Several companies offer kayaking tours in Abel Tasman National Park, ranging from just 4 hours all the way up to 5 days. 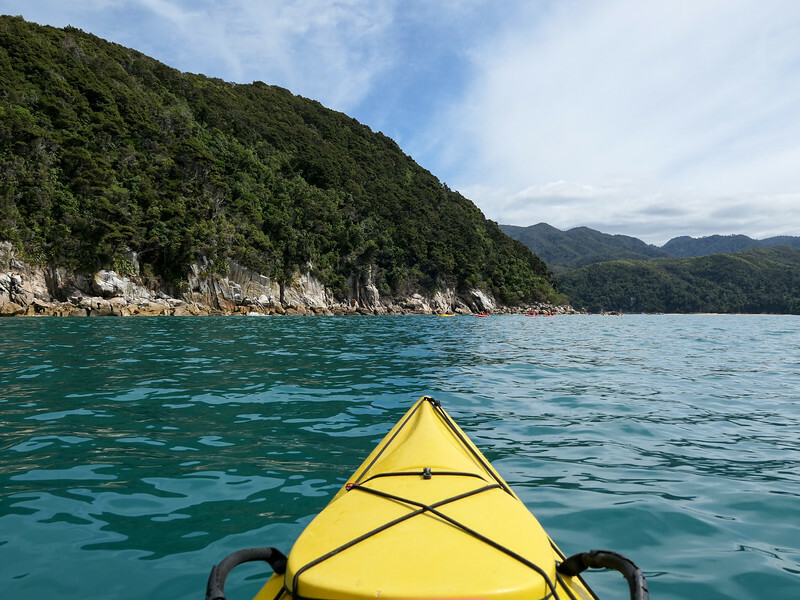 We only had one day, though, so we opted for an afternoon kayaking tour with Abel Tasman Kayaks. 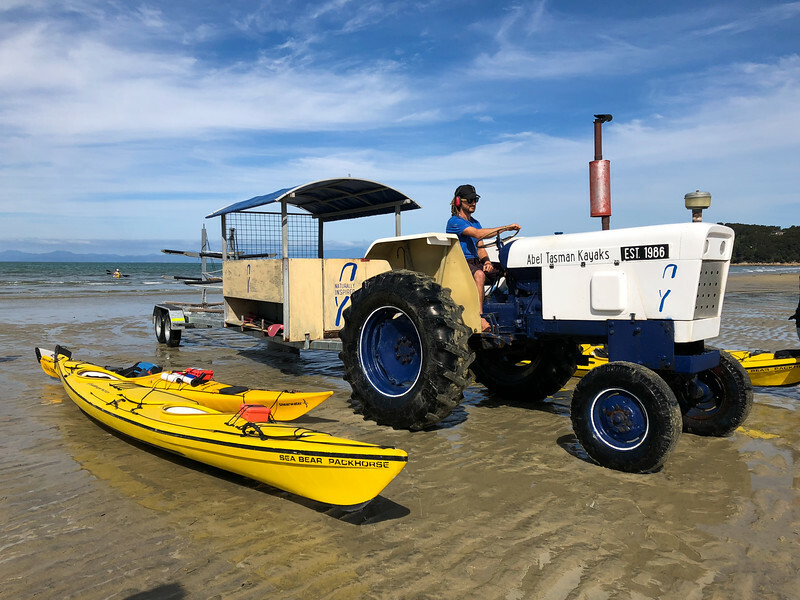 We checked in at their office in the tiny coastal town of Marahau, and were soon being loaded into a water taxi with a guide and some brightly colored kayaks. The water taxi took us out to Observation Point, a very popular jumping-off point for shorter kayaking tours. Here we had a picnic lunch before getting kitted up in our kayaking gear. 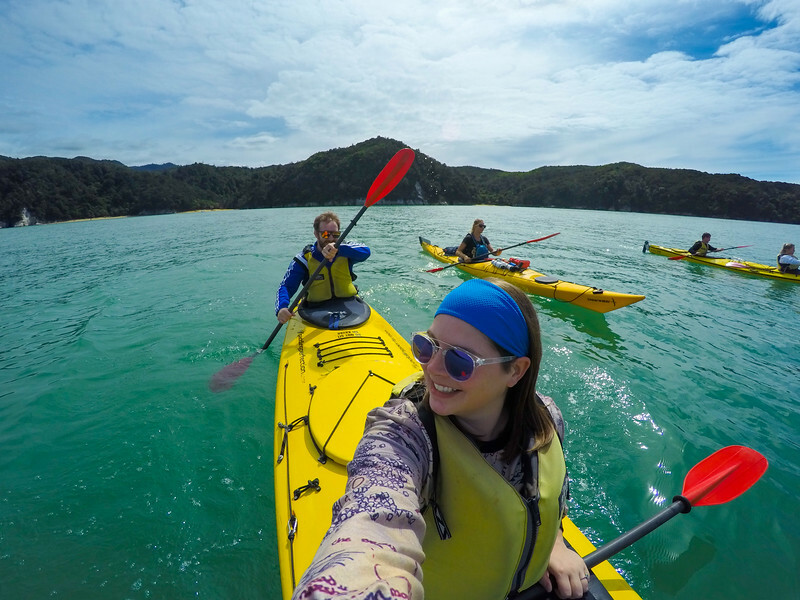 Abel Tasman Kayaks uses spacious tandem kayaks and gives everyone paddles, spray skirts, and a dry box you can put a camera or your phone in. 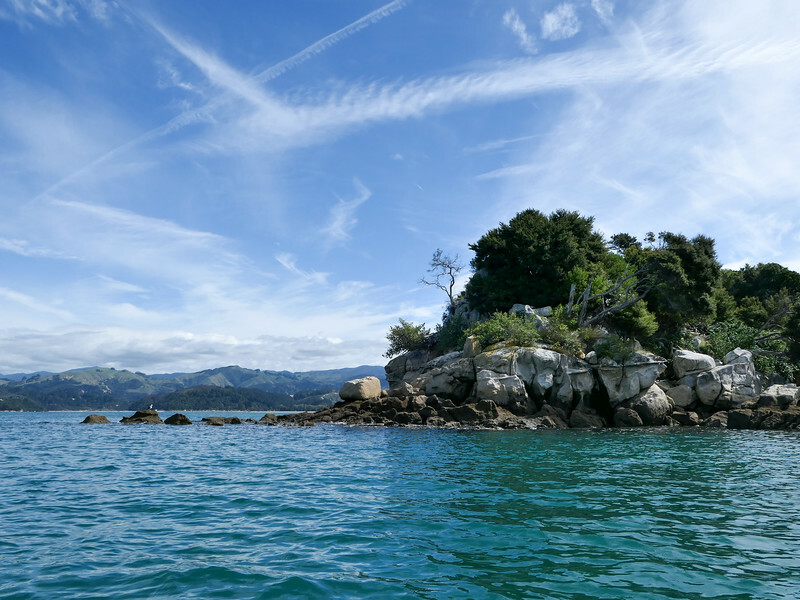 Before we knew it, we were pushing off into the blue-green waters of Abel Tasman National Park. I had been kayaking before quite a few times, but this was Elliot's first foray into any sort of paddling sport. 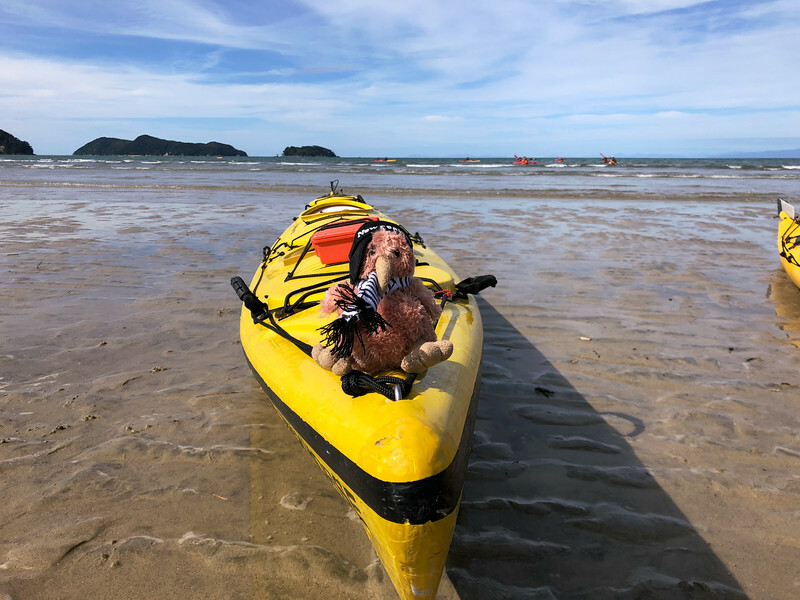 It's safe to say that he fell in love – we were talking about potential ways we could store a kayak in our small Ohio condo before we even got back to shore. After leaving Observation Point, we paddled over to Adele Island, where we spent some time watching baby fur seals gamboling across the rocks from our kayaks. Can you spot the seals? Adele Island is a wildlife sanctuary and is also known for its rich bird life. In the early 1800s, another explorer (the French explorer Dumont D’Urville) came to this part of New Zealand and named Adele Island after his wife. But our guide said there's a story that goes that D’Urville refused to anchor too close to the island because the bird song was so loud! From Adele Island, we paddled around the smaller Fisherman Island before finally heading back to shore. And even though we had a feeling we'd have some sore shoulders the next day, both Elliot and I agreed that this was one of our favorite things that we did in New Zealand! How long: All in all, we paddled for probably 2.5 hours, while the whole tour lasted for maybe a total of 4 hours when you count the water taxi ride, lunch, getting geared up, and helping load the kayaks back up once we returned to the beach. How difficult: And, even though you stay within sight of shore the entire time, kayaking in Abel Tasman National Park is still sea kayaking – meaning it can indeed get tiring and does come with risks (for example, we all learned what to do in the case of our kayak flipping over before we left shore – but this doesn't happen often!). What to bring: If you're interested in doing a tour like this, I recommend wearing layers on top, shorts or quick-dry pants on the bottom, water-friendly shoes (I wore my Teva Verra sandals), and a hat or headband. And sunscreen and sunglasses are also a must! 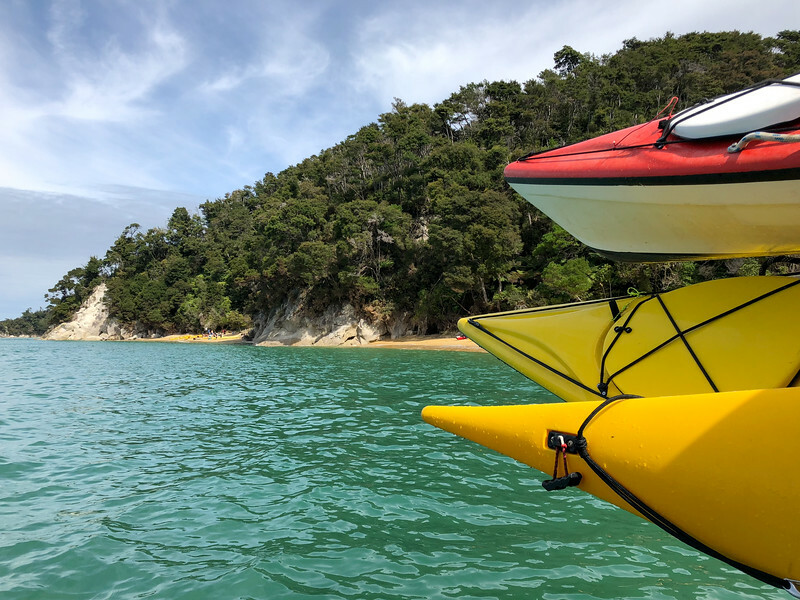 Go on a scenic cruise – If kayaking doesn't sound appealing, you can also take to the water on a scenic cruise from Kaiteriteri. Some cruises will include a meal, wildlife viewing, and sometimes even a short walk within the park. Mountain biking – There's mountain biking within Abel Tasman, too, with the Gibbs Hill Track being one of the most popular. Go skydiving – Yup, you can go skydiving over Abel Tasman National Park! Check out Skydive Abel Tasman, located in Motueka. 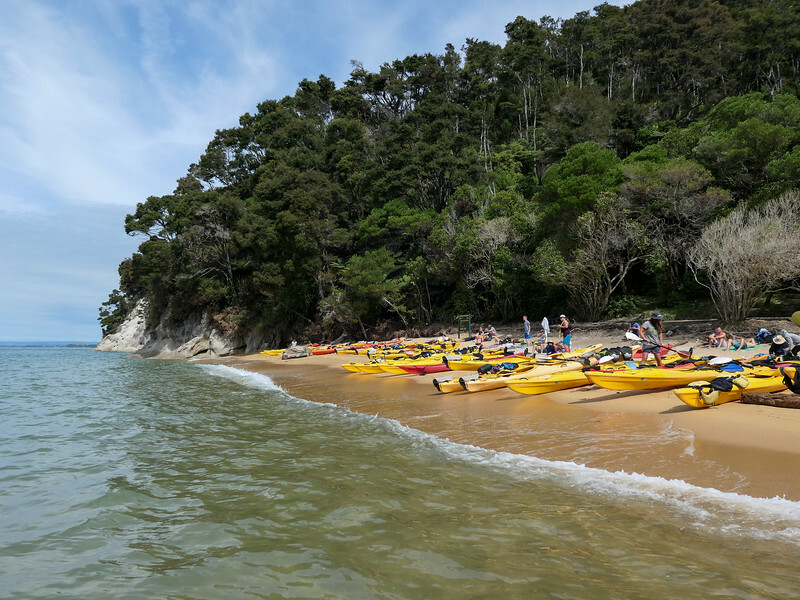 Abel Tasman National Park is accessible from the towns of Marahau and Kaiteriteri in the south, and from Golden Bay and Totaranui in the north. Most tours and water taxi services depart from Marahau or Kaiteriteri, though, so I recommend staying south of the park. Split Apple Retreat – Located adjacent to Abel Tasman National Park between Kaiteriteri and Marahau, Split Apple Retreat is pure luxury. Every room has a private deck with sea views, and guests enjoy a gourmet breakfast, private beach access, and a saltwater infinity pool. Split Apple Lodge – This boutique eco-lodge set on a hill above Kaiteriteri is the top-rated hotel in the area. Abel Tasman Lodge – This Marahau hotel is just a 5-minute walk from the beach, and most rooms have a kitchenette. Aquapackers – If you're looking for a unique hostel experience, this one might be the coolest of all. 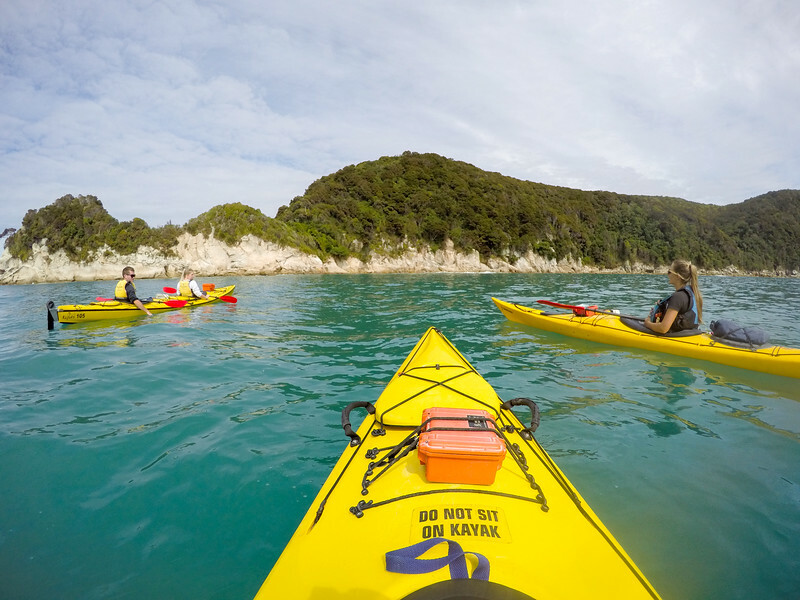 Aquapackers is a floating backpackers at Anchorage Bay in Abel Tasman National Park. Dorm rooms come with dinner and breakfast. Just note that you do have to hike, kayak, or take a water taxi here – there's no road that leads to Anchorage Bay. Motueka TOP 10 Holiday Park – If you're traveling with a campervan or looking for an affordable motel unit, I can personally recommend the Top 10 park in Motueka. Holiday parks are popular all throughout New Zealand, and this one was especially nice. It's within walking distance of Motueka town. Have you ever been sea kayaking? 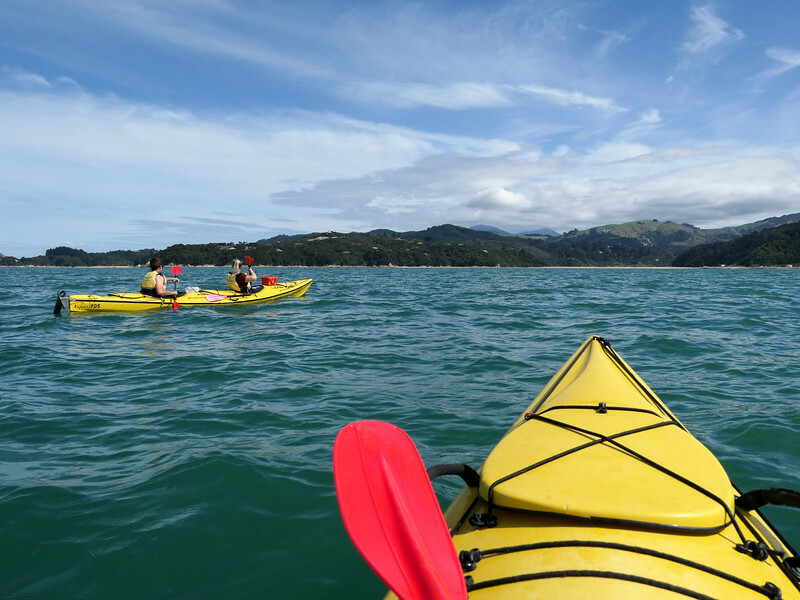 Which activity would YOU choose to do in Abel Tasman? We didn’t eat anywhere in the national park, but we did stay not far away in Motueka and ate at a great place called the Smoking Barrel! Their smoked meat platter is sooooo good! Aww those baby seals looks so cute! I have never been kayaking but it looks tranquil enough for me to try it 🙂 I don’t think I would try rafting any time soon. It’s definitely not as scary as rafting!! There were a few moments when we were out away from shore that some weird waves made me nervous, but for the most part kayaking is really nice! I went on a kayak trip on one of the lakes in Berlin. It was supposed to be for a “fashion event” so I was dressed for the “event” and not for kayaking. OMG! My dress got so wet, and I had to leave my shoes behind because, well, they were nice shoes! I also forgot one most important thing. I don’t like open water! Wow, fantastic! It looks so beautiful 🙂 I love kayaking, but for now I only do that in our polish rivers, which are beautiful too, but not like this. 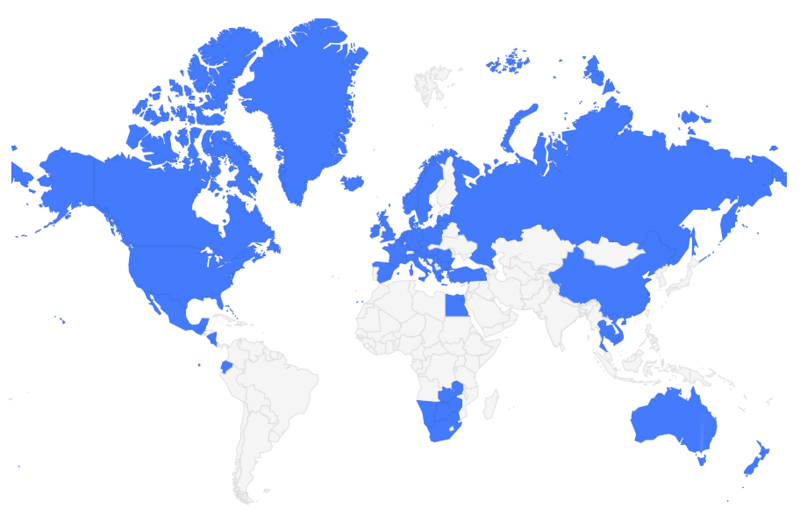 Maybe someday soon I’ll go to New Zealand too! The water colors in New Zealand are something else! One of the places I regret having to miss out on my NZ trip. Looks so nice! 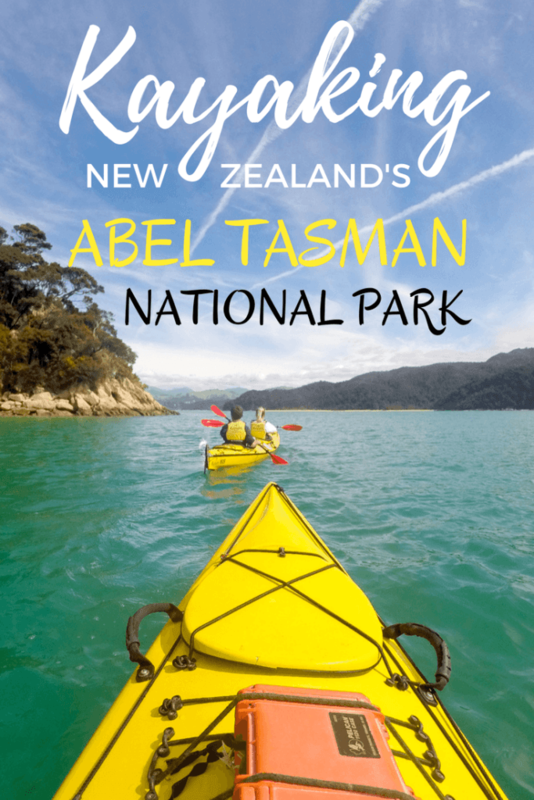 This was my 5th trip to New Zealand, and the first time I managed to spend any time in Abel Tasman! So maybe next time you can get there! It’s so beautiful. The water looks so clear, who won’t love to kayak here. Maybe someday I’ll go to New Zealand too! The water was SO clear and so blue-green. I love getting out on the water in New Zealand! Kayaking is so hard, i’ve tryed once and I had difficult, it was a double kayak, maybe because of this it was tough haha. Sometimes tandem kayaking can be hard if the two of you aren’t in sync with your paddling! Yeah, that was our first time on a Kayak.